Actor Pat Morita, best known for helping teach a boy martial-arts mastery through household chores as the wise Mr. Miyagi in "The Karate Kid," has died. He was 73. There were conflicting reports about the cause of death. His daughter Aly Morita said he died Thursday of heart failure at a Las Vegas hospital; longtime manager Arnold Soloway said the actor died of kidney failure at a hospital while awaiting a transplant. His wife of 12 years, Evelyn, said in a statement that her husband, who first rose to fame with a role on "Happy Days," had "dedicated his entire life to acting and comedy." A generation of young fans mimicked Morita's famous "crane kick" technique from the finale of the movie, which surprised many by grossing $91 million and establishing a popular franchise. 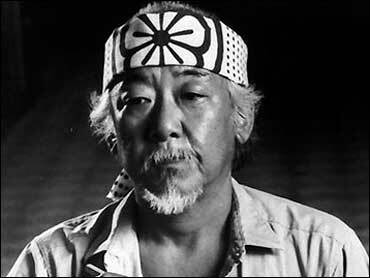 "Forever my Sensei," Macchio added, referring to Morita's role in "The Karate Kid." The role earned Morita an Academy Award nomination for best supporting actor, but he lost to Haing S. Ngor, who appeared in "The Killing Fields." For years, Morita played small and sometimes demeaning roles in such films as "Thoroughly Modern Millie" and TV series such as "The Odd Couple" and "Green Acres." His first breakthrough came with "Happy Days," and he followed with his own brief series, "Mr. T and Tina." "The Karate Kid" led to three sequels, the last of which, 1994's "The Next Karate Kid," paired him with a young Hilary Swank. Morita was prolific outside of the "Karate Kid" series as well, appearing in "Honeymoon in Vegas," "Spy Hard," "Even Cowgirls Get the Blues" and "The Center of the World." He also provided the voice for a character in the Disney movie "Mulan" in 1998. "Only in America could you get away with the kind of comedy I did," he said. "If I tried it in Japan before the war, it would have been considered blasphemy, and I would have ended in leg irons." Morita was to be buried at Palm Green Valley Mortuary and Cemetery.